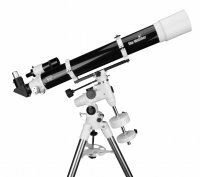 The Sky-watcher EVOSTAR series are two-element, air-spaced, multi-coated objective achromatic refractors. They are truly outstanding, high-performance, high-resolution instruments manufactured to extremely high standards of optical and mechanical precision. With their long focal lenghs and breathtaking, diffraction limited optical performance, they are ideal for the detailed high-power study of the Moon, Planetary Surfaces and other objects in our solar system, giving crisp contrasty images. These telescope packages will stand you in great stead for a lifetime of serious astronomical viewing.